187 labyrinths found. Showing 161-180. Sorted by country, state, city, then zip/postal code. 1 mile down the road from St Just to Cape Cornwall. Big white house on the right, where the road takes a sharp left. Labyrinth design on the gate and the Labyrinth proper is in the upper garden. 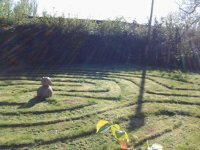 Our Labyrinth is situated in a spectacular location on the hillsides surrounding Looe Bay, with breathtaking sea and coastal views. 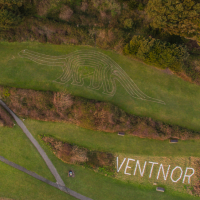 It was originally created to enhance the coast path walk between Looe and Seaton, but the path has been diverted due to landslips, and no longer runs alongside the labyrinth. 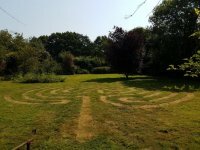 So if you want to visit it, come and stay in our off-grid Old Coach House - or come to an event here - and walk the labyrinth any time, day or night (it's utterly amazing under a full moon reflecting off the sea!). If you plan to get here by walking, wheels, water or wings, you'll be equally welcome. Lots more information on our website, below. 50 deg. 21'30" ° Lat. ; 4 deg. 25' W° Long. Pass the pub "The Bull in Streatley", after c. 100 metres turn right - between houses are stairs and footpath up to the hill through the forest Holies. Follow the path till gates. There are 4 paths after gates, select the second from right side. Follow the path and soon you can see 3 labyrinths on the left side. The new owners of the land have asked not to be disturbed or contacted about this labyrinth. 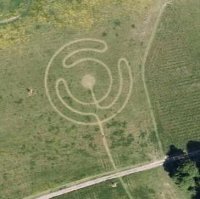 The labyrinth may still be viewed remotely via Google Earth. Simple grass labyrinth situated within our walled garden. The labyrinth before the plants were planted. 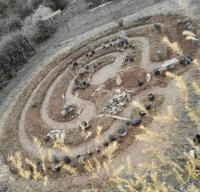 The labyrinth is situated in the Landmatters off-grid Permaculture Community. Directions to the House can be found on our website. Within the grounds of Epiphany House, on private land but accessible to the public. Please email or ring for directions - we are between Truro, Redruth and Falmouth. Our labyrinth commands a 60 x 50 foot area, the path laid in bark and scallop shells. The meditative walking journey from the outside to the inside and back takes about 20 minutes to complete. The centre grove is home to a horse chesnut tree surrounded by woven willow. A journey through the transit of the sun, the turning of the earth and the orbit of the moon. 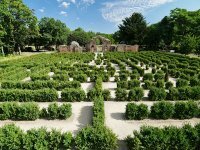 The labyrinth is fairly high maintenance, needs frequent weeding, and the scallop shells need replacing in their lines due to the frequent nocturnal parties held by the rabbits! Come along and experience a weeding meditation... very close to nature! 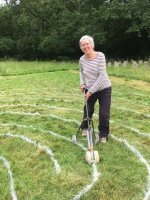 You are welcome to walk the labyrinth alone or in a group - please contact us to let us know when you would like to visit. The labyrinth will be marked for a trial period which will probably end in autumn 2016. If the trial is successful then we will seek permission to level the ground and mark it more permanently. From Ventnor, Isle of Wight esplanade, head west and the road climbs to a hairpin bend with La Falaise car park straight ahead. Continue west towards the far end of the car park. Just before the end take the footpath to your right and climb the path and steps to a grass area upon which the labyrinth is marked. The labyrinth is marked in the shape and full size of a Diplodocus dinosaur. It is based upon the classical 7-circuit design - the four "turning points" reconfigured to point downwards to form the legs. Zig-zags have been added at the neck and tail. The point of entry is the mouth and goal the stomach! The ground is currently uneven and is probably not suitable for wheelchairs. The labyrinth has been designed and constructed for spiritual and therapeutic use by staff and patients. Opens World Labyrinth Day 2nd May 2015. Available until the end of the hay meadows growing season (end of July) when the meadow is traditionally cut. A seasonal labyrinth situated in the Nostell Priory Parkland, complete with central picnic/ reflection space, including 6 tree stumps stools representing minerals, plants, animals, humans, angels and divine. By Car: 5 miles south-east of Wakefield towards Doncaster on A638. Schedule: Installed in the parkland, which is open from 7.00am to 7.00pm daily. A Crossing Labyrinth. A contemporary design which offers 4 different routes into the centre. Hay meadow containing 18 different species of grass and plants. 53 39' 28.9 N° Lat. ; 1 23' 05.38 W° Long. Visit the Wakefield Cathedral website for visitor opening times. Aerial view of Bridge House Labyrinth. Bridge House is on the north side of Shillingford Bridge, which crosses the River Thames on the A329. Located in Quaker burial ground to rear of Meeting House. Bus: W19 and 145 stop nearby. Underground: 15 min walk from Leytonstone (Central Line). Cycle parking to rear of building on right. Limited car park at front. Grass is rough, please take care. Finger labyrinths and information leaflets available inside Meeting House. Open for Quaker Wednesdays, first Wednesday of the month, 10-11.30am and 1-2pm. All are welcome. Indoor labyrinth walk in inclement weather (check with Jan in advance) 10-11.30am (closes 11.30am). Also open for Leytonstone Arts Trail, first two weekends of July each year, 2-5pm. Wanstead Quaker Meeting House. Contact: Jan Sellers. Initially painted on grass, 2016; then shrub clippings to mark the path, 2017; has now developed to a strimmed grass labyrinth, 2018. Situated in the school grounds, this labyrinth consists of three inter-connected three-circuit labyrinths to represent the Trinity. It is located in a Prayer Garden and was installed to provide a quiet, prayerful space for the children. Access to the labyrinth is subject to the consent of the school senior management. Original design consisting of three inter-linked three-circuit labyrinths. A Franciscan contemplative hermitage, with self-catering accommodation available by prior arrangement.